One of the key difficulties in measuring effects and attributing causality is the fact that there are typically many confounding factors. That is why social scientists (and financial economists) often resort to event analyses — looking at what happens around a certain event (like an announcement) when little else is happening. Because there is so much going on with the Trump administration, this is not always possible. 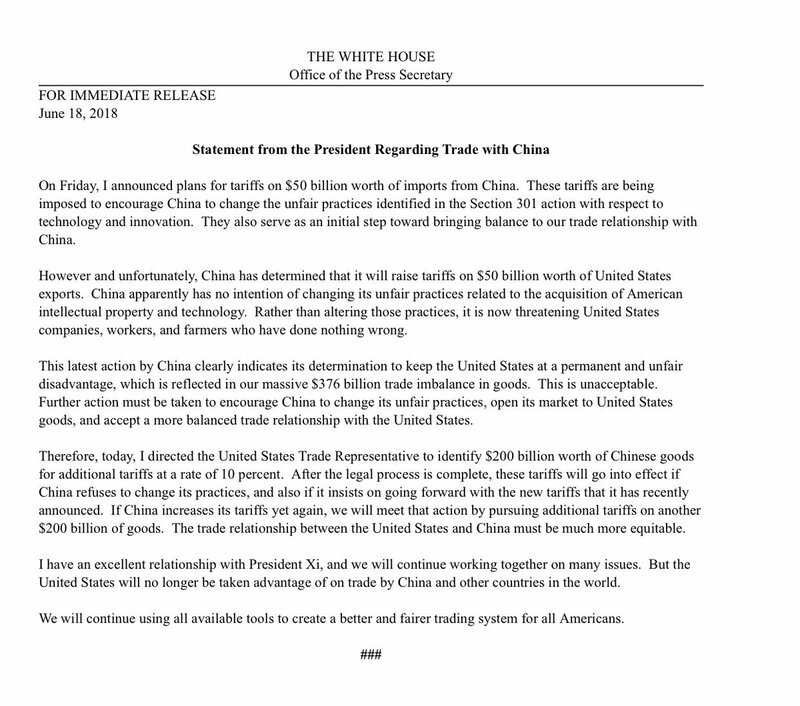 However, yesterday evening, the White House released a directive to USTR to identify an additional $200 billion worth of taxable Chinese imports. Here is what happened. 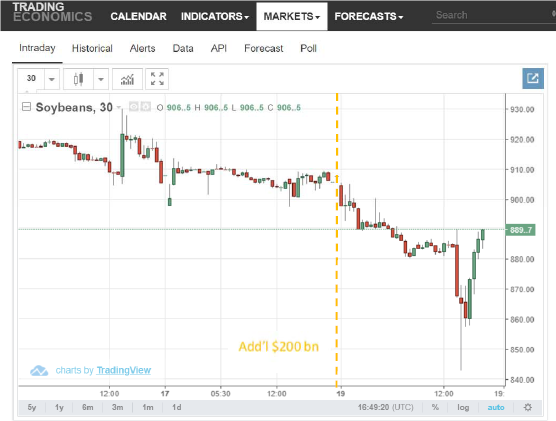 Figure 1: Soybean July futures, 30 min increments. Time stamp is UTC. Dashed orange line at approximate time of WH release. Source: TradingEconomics. Note the drop in electronic trading upon Mr. Trump’s statement, and then a bigger drop and recovery to post-statement levels at the open of CBOT. To my knowledge, no soybean market-moving information was released between 8PM or so and 10PM Eastern time. Some context is provided by the July futures over the course of the past year. 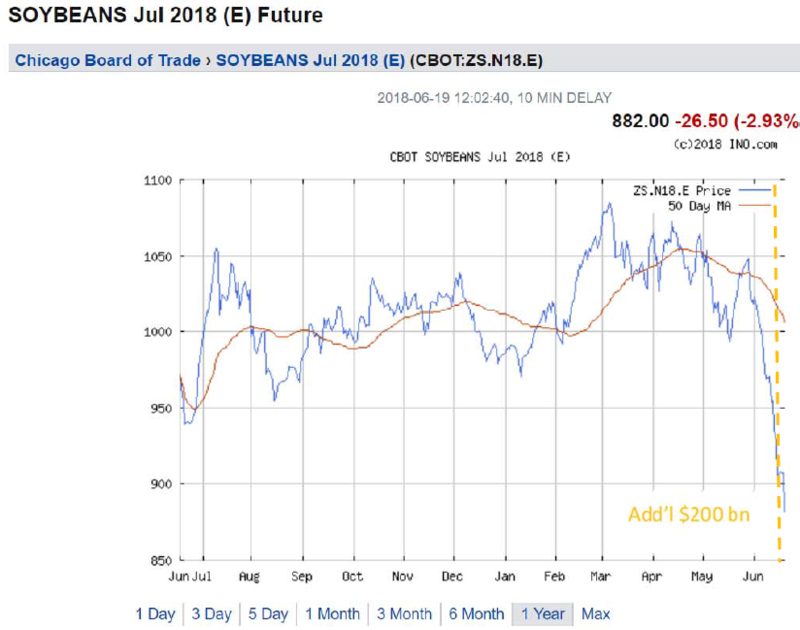 Figure 2: Soybean July futures. Dashed orange line at approximate time of WH release. Source: ino.com. So, I thank Mr. Trump, as a social scientist, for providing another clean example of the event study methodology in action, to use in my classes. This entry was posted on June 19, 2018 by Menzie Chinn. Menzie. did you notice these estimates? i meant to ask what your model estimates are? IMHO – Menzie should refuse to answer ANY of your questions until you read Fama (1970). After all – there are basic standards to economics which you completely lack. Menzie, now you are back to playing silly games. You provided a reference after your reaction to my admittance to not having read his papers. I have since read your reference, as well as some others to ID who Fama was. Now what? CoRev: This post was not addressed to you. It was a general observation. ID who Fama was? Are you kidding me? You do know he received a Nobel Prize for hiw work. Now you say you read his 1970 paper. If you do – then Menzie’s opening to his latest post should be very clear. And yet you protest? Pgl, OK. Tell us who Grace Hopper is, and for what she is famous. As an investor who specializes in overseas oil & gas exploration companies, I am most grateful to President Trump for the higher oil prices. He is such a peach. Economists should be ecstatic. Rarely has an American president provided so many natural experiments. Graduate students should dine out for years, if not decades. The graduate students will likely be able to purchase California wines more cheaply when the Chinese government places tariffs on that too! U.S. exports of wine and beer to China reached almost $92 million in 2016. If Trump does not screw this up – I sense a growth sector! 90% of exported wines are from California. Biggest buyers are EU countries followed by Canada. China is–or at least, has been–a growing market for California wines. For those unfamiliar with the state (but who seem to know everything about California including that plethora of $2 Million homes everywhere) who believe only the Napa area is involved, think again: there’s considerable growth on the Central coast, the Sierra foothills, the Central Valley, the North Bay, and more. A tariff war will require lots more wine purchases domestically. I’m doing my part, but I can only do so much. Oops, past 2:30. Late to my 2 o’clock glass. Do you realize in a short time the Permian Basin alone will be the 3rd largest oil producer in the world? Ignoring the total US production only Saudi Arabia and Russia will have greater production. Be very careful in expecting higher oil prices. unhinged peak loser goes on another ideological rant! Baffling, you should read the Harvard study on mainstream media bias, rather than have another hysterical fit. Are you telling us Buffet is a Trump supporter? More lies please. Baffled, Troll, Add some value. BTW, do you remember an article by econbrowser re: the past month’s jobs report? corev, you don’t think peaky was trolling with his commentary? why the silence with respect to him? simply tells me you are a political hack. Baffled, “you don’t think peaky was trolling with his commentary?” Actually no! Why would you think quoting Buffet is trolling. Not everyone, not even all moderates and even liberal, believe as you do. What makes your beliefs more correct than theirs? just amazing. corev, i guess you did not read the last paragraph in his comment. then again, reading comprehension is not one of your strong suits. so again, i ask of you, was peaky trolling? of course he was. corev, are you too stooopid to even understand that? y’ano. Baffled, you didn’t answer my question. I also believe in karma. The more they are bullying him, they more success he will have. Anyway. Buffett is right this time, too. “You have to put things in perspective, right? If we just look at our four biggest trading partners they have a simple weighted average tariff of about 6 percent, we have one of 3½ percent. So there is a 2½ percent gap in unfairness.” And Buffett can not be considered a Trump fan. Relax guys. It’s the perspective. For the Love of God and everything that is good about humanity, please bookmark the above PeakIgnorance comment link for future use. pgl: I agree. Inexpensive quality wine, readily accessible by graduate students, should be an important policy goal. Oh? Secret growth, eh? Sounds mysterious, and inviting. I do like the 4.5% to 5% real growth forecast. Too bad a market does not exist, because I would love to bet with real money that US real growth for the rest of the year does not even come close to 4.0%, let alone a higher rate. But if you have historical evidence that trade wars spur faster rates of economic growth, I am all ears. Erik, how much do you want to bet we’ll get faster GDP growth this year than last year? Greater free trade and open markets, which is the objective of the Trump Administration, will facilitate growth. Of course, it’s not easy or politically popular, which is why previous Presidents avoided the problem. Is that supposed to be an example of post-modern irony? Or are you really that detached from reality? You do know that several of Menzie’s latest posts have been about Trump’s crazy tariffs? You know that, right? And somehow higher tariffs equals greater free trade. Maybe you should change you blog name to “CognitiveDissonance”. 2slugbaits, and I’m sure, you believed the North Korea problem Trump inherited would end in nuclear war. PeakTrader Only if Trump launched a first strike. What I believe in is deterrence theory. Growth in 2017 was 2.3% and growth during 2018Q1 was only 2.2%. What has changed since then? Higher interest rates and trade wars (not free trade). Now if you have an econometric model that says this will lead to faster growth, publish it in the American Economic Review. I can see a Nobel Prize in your future! I suspect that Peak Trader is thinking in nominal terms and expects high inflation. I expect stronger real growth. PeakTrader: You will not be disappointed. First, however, comes draining the swamp. For the main impediment to growth is corruption. Broader and deeper by a magnitude than your wildest imagination. And not to leave you hanging, the light show is about to begin … within weeks, months at the most. JBH When you say “draining the swamp” I assume you mean impeaching Trump. I hope not. As much as the clod deserves it, I’d rather see the GOP go down in flames with Trump leading the way. The rest of your nonsense reminds me of some old coot I saw about a month ago standing on the street holding an ill-made sign telling motorists to repent now because Jesus was coming soon. Tell me, were you embarrassed when Trump hugged (or was it sexually assaulted?) the flag today when he gave some speech? Is that the “light show” you promised? 2slugbaits:As usual for all my comments, that to PeakTrader is quite clear. Trump is the one draining the swamp. Only in the dreamworld you live in will Trump be impeached. 2slugs: “No, I don’t think Trump will be impeached…unless the Democrats win a House majority in November. Even at that, he would never be convicted in the Senate.”, then why are you trolling? It just makes you lack of objectivity more obvious. Your whole comment was valueless. Why would you think we care about your opinion? 2slugs, to continue, Do you even know to what he was referring: ” the light show is about to begin … within weeks, months at the most.”? JBH, worthless politicians and bureaucrats refuse to go. A much smaller and limited government is needed. Of course, those, who are DMV or post office material want big government. As far as growth-sabotaging bureaucrats, these will attrition over time. If Republicans keep control of the House – and they will – passage of legislation in 2019 will begin to chip away at the tenure choke lifers have for so long had over the size of government and, more importantly, on the drag their day-to-day actions have on the private sector. There’ll also be a new Speaker aligned not against but with the president. What a difference this will make! Think through the synergies all this will have. And be patient. Roma die uno non aedificata est. JBH No, I don’t think Trump will be impeached…unless the Democrats win a House majority in November. Even at that, he would never be convicted in the Senate. Trump deserves impeachment and conviction, but I don’t support it for political reasons. Like I said, I’d rather have the GOP chained to Trump as he goes down in flames. But Trump is the king of the alligators in the swamp, so when you talk about draining it, I naturally assumed you meant getting rid of Trump. And Pruitt. The rest of you nonsense is just the usual tinfoil hat stuff that we’ve heard from you many times before. You didn’t say whether Trump’s flag hugging spectacle creeped you out or not. If an NFL player did that I’m pretty sure most people would say the player was disrespecting the flag. And we expect 100 lies a lie from you. Keep up the good work! Menzie, maybe I am being condescending to your readers. I mean I know some of them “got” this, and I wager some did not “get” this. Did you want to point out the thin grey lines represent trading volumes in your caption?? Remember, CoRev apparently didn’t know until today who Eugene Fama is and you had to teach “Princeton”Kopits basic stats terminology….. so……. Or the thin grey lines represent other price movements during the day?? I guess it’s not a big deal, but it might be interesting to know trading volume as well. I think Event Studies are important and worth doing research papers on and add insight. However I do think to a degree, this falls into a lot of wishful thinking involved in economics theory. And I’m going to use an analogy most Economists will think absurd, but it’s to make a point. Let’s say you had an Event Study on people who spill scolding hot coffee on themselves (no, this has nothing to do with McDonald’s lawsuits). Now if you did an event study on that, and asked all those people 24 hours later “Did this F___ up your entire day?? Did you feel that day was bad for you? ?” The event study would tell us the spilling of hot coffee Event had a big impact. Now ask them 6 months later how much the scolding hot coffee impacted their lives. In fact the “Event Study” becomes a type of self-fulfilling prophecy. Don’t we intuitively know when we narrow down the window of ANY event it takes on greater importance?? The point I am trying to make has no connection to my thoughts on the Trump tariffs on imports—which I think will have a broad and deep negative impact on peoples’ lives. But in my personal opinion, it’s better to look at the actual numbers such as lost sales of the commodity in question or commodities in question than on those “event studies”. You know, I’d rather just straight that same day look at the quality of the “drinking lid” on the coffee cup, then go “Yeah see, they all said it F’ed up their day”. Peak Trader: Having read a bit of the growth literature and having examined growth data sets, then given the current twin deficits situation and the strong US dollar…. hmm, shall we start at US$100,000? You will not even have to try for a full year of real growth in excess of 4%; if the US economy grows for 2 quarters in excess of 4.5% annualized over the next year, you win. The tough part is setting up the contract. You see the problem Peak Trader is that you support Trump. Trump is the “Lie-a-minute” President and that means that Trump has no integrity. Alas, by association, you have no integrity. (Akin to a pooling strategy.) So the expected costs of enforcing the bet are simply too high. But I will make you a gentleman’s bet. If I win, you explicitly state that you were wrong and then apologize. If you win, I state that I wrong and then apologize to you and all the Trump supporters. Here on MC’s blog pages. Erik, I support fairness, which you don’t care about, given your blind hatred of Trump. You can’t be trusted, like the biased mainstream media you support. You can say you’ve been wrong and apologize now. When caught babbling lies – which you do routinely – you spew off childish insults like this one. Everyone here gets this so why not knock it off and act like an adult? Nomi Prins’s “Collusion” is one of those things on my HUGE pile of things I need to read (and it’s a big book). I’m a big fan of her writings. She has a sharp mind and I think she cares about the world around her. I’m using a server based in New York. I have lived in agricultural communities. I’ve lived in some of the largest metropolitan areas in the US. I just saved 15% on my car insurance by switching to Geico. I’ve worked on farms that grew & harvested soybeans. I’ve lived on both US coasts. I like drinking Pina Coladas and getting caught in the rain. Being that you’re keen on using stereotypes to judge large swaths of Americans such as making unfounded, ignorant, and dogmatic assumptions related to American citizen’s geography, tell me should I care about this blogpost? Also, in the post where you say people wiring in from New York believe that ag is trivial, I also stated “because of Menzie’s quantity over quality approach to blogging combined with this childish deameanor, there’s always a new blog post to top off the blog creating new “discussions” as the continual piling of the trash heap burys prior discussions in favor of Menzie’s emotional and subjective flavor of the minute. His approach doesn’t seem beneficial towards fruitful discussions/debates.” As such, you recently penned a post entitled “Mr. Trump’s Separation Policy and a Little Bit of History”( http://econbrowser.com/archives/2018/06/mr-trumps-separation-policy-and-a-little-bit-of-history) but didn’t mention Obama shelters having nearly 25,000 unaccompanied children in 2013 (https://www.motherjones.com/politics/2014/06/child-migrants-surge-unaccompanied-central-america/). Does anyone know why there were so many more children during the Obama administration? Maybe it’s apple to oranges… if so, why? See, it’s difficult to have meaningful discussions on this blog because no one has the time or interest to wade through the trash heap of Menzie’s flavor of the hour (I do wonder if this is an intentional diversion), but I thought I would bring this up on the newest post as an example if not to discuss in general. rtd: A little sensitive about your current location of residence, aren’t you? The MotherJones story you referenced was about an unaccompanied minor. Both photos included in the post are of children taken away from family members. Do you not see a distinction? In any case, I will take your observation as implicit support for the current administration’s implementation of the law. And I will further note I am completely unsurprised by the fact that you support it. I congratulate you on saving 15% on GEICO. Sensitive? Not at all. I’m just disappointed in your stereotyping a large portion of Americans – i would expect better from someone who constantly blogs about groups who have been stereotyped and marginalized in this nation’s past. Here you go AGAIN making assumptions. Why do you do this all the time? I simply asked a question about an article – what on earth would make you think that asking a question is an “observation as implicit support for the current administration’s implementation of the law”??? Also, why would you note that you are “unsurprised”? Also, how is an assumption that you make now a “fact that [I] support it”? Talk about fake news… you couldn’t care less about objectivity and unbiasedness (readers already know that)… you’re really on a roll today!!! I would honestly love to hear your answers. rtd: I apologize. Let me correct. I am unsurprised that you de facto say that the current situation is in your mind much the same as it was under the Obama administration, and hence imply that it’s ok.
Wrong again – two times. 1) I never implied “the current situation is in [my] mind much the same as it was under the Obama administration”. Nothing close to that. 2) I never implied policy from either of the two administrations were ok or not ok. Nothing close to that. Please explain yourself and why you are such a fervent believe in biased and subjective dialogue. And/or explain why you are unable/willing to critically read the comments in your own blog. Ergo, you should apologize (again) and correct (again)… or more likely bury this among your trash piles. rtd: Then why provide the MotherJones article referencing situations under the Obama administration? I’d say you were trying to have it both ways. What you continually fail to understand is that it is, in fact, possible for (some) people to discuss an issue without stating/implying/suggesting their stance on said issue. It does seem that The Dr Chinn approach often favors emotions and can tend to shun objectiveness – so this could explain why you are wrong here (again) and continually have difficulty understand the aforementioned. This despite the fact that you have made similar errors numerous times in prior comments/posts & have been called out for it. I (and other commenters) just want you to be better – a lot less unneeded emotion, a lot less less biases, a lot more objectiveness, and a lot more critical reading… that’s all… don’t make this otherwise fine blog look so bad. I can’t wait to continue this dialogue with you as I’m sure you have more to say on this. Thanks for the replies. rtd: Thank you for your reply. Since I am unable to fulfill to your satisfaction what you deem an ideal blog, I suggest you set up your own. I don’t need to do anything… there are great blogs out there that I frequent including Jim Hamilton’s Econbrowser. This was just a red herring, which you also do so well… do you care to stay on the topic at hand and explain why you make unfounded assumptions and find it difficult to be objective and rational in discussions within your own blog? Do you seriously not understand that people are able to discuss an issue without implying their own opinions? Also, why did you feel the need to cast (fairly negative and definitely subjective and ignorant) stereotypes over a large segment of the American population? It’s a very Trump-like thing to do and an awfully bad look for an educated individual responsible for post-secondary education. RTD, well done, and worth another “LIKE”. You still haven’t answered why it is that you feel the need to cast (fairly negative and definitely subjective and ignorant) stereotypes over a large segment of the American population based on geography. RTD, have you noticed ho often Menzie ignores a direct question? Aaaaaawwww, see, an NYC conservative snowflake had his feelings hurt. Who knew conservatives could be such sensitive snowflakes also?? I thought it was only liberals all this time. “rtd” Did you want Menzie to send you a bouquet with some pink peony flowers?? Maybe some white lily flowers?? You might look cute walking around NYC holding some buttercups. I bet Menzie appreciates that you visit regular to this blog though. It’s really kind of sweet of you (I don’t wanna say “cloying” because I know you’re a delicate boy) , and I smell a kind of burgeoning love coming from NYC towards Menzie. “rtd” turn this up loud and I promise the tear drops of unrequited love will end….. someday……. Peak Trader: I don’t hate Trump. He reminds me of a number of nouveau riche garish men I have met but none of them, including Trump, are worth “hating”. Besides, I grew up listening to stories of military occupation and resistance to that occupation. That puts the term ‘hatred’ in a whole different league. Trump speaks with forked tongue. He has no compunction about ripping up existing agreements. He constantly makes up ‘Trump-facts’ and lies. Why would I trust him or anybody that professes loyalty to the Trump? Because I measure 196 cm, have blue eyes and white skin? Erik, I detect you harbor real anger towards Trump. I guess, if I was Canadian, I’d be angry all the time, and not even know why. With “rtd” getting a menopausal hot flash from generally true comments about New Yorkers (here meaning those residing in NYC), one wonders how “rtd” would have reacted as a small child being put in a cage without the accompaniment of his parents at an ICE “distribution center”?? While not connected directly to Soybeans, one happening is important. With the amount of goods at 200 billion, US tariffs are now grater than a years worth on China imports. It is becoming very difficult for China to find retaliatory tariffs. And any subsequent rounds by US are going to make it much more difficult on China. Makes it a good time for China to negotiate a rational trade policy that is no longer so detrimental to the US. Ed Hanson: As I noted, China could retaliate on investment via GATS and on movement of people using visas (getting one already an onerous task, let me tell you!). There’s also regulatory discretion (and they still have a vast capital controls apparatus). That’s all what I meant by asymmetric (commercial) warfare. So I don’t think our hand is as good as you think it is. Menzie, it’s not my business. And I know it’s not my business. But there are more and more games being played with Americans on short-term visas, basically being held hostage in Beijing. They are being used as bargaining pieces to trade for Chinese “criminals” who the USA has been balking returning to China. I think that although I view you as 125% American male, your Chinese face puts you into a much higher “risk category” for “kidnapping”. Unless you find the pull of family to be stronger than you can withstand, or have friends of very high rank there, I would avoid it if I was you. That “none of my business” thought was said out of concern for your personal safety and well-being. If I was a betting man, I put 80% odds on Nielsen’s time in the White House ending inside of the next 3 months (before Sept 19). But I thought Kelly would be gone by now, and at the very least I had Rosenstein gone at 50/50 odds some weeks ago—so give my 2cents on it whatever you deem it worth. The greater the China retaliation the greater the damage to Chinese economy. The easy stuff is over. Our hand is getting stronger. Not to say our stronger hand does not come without pain. Ed Hanson Yours is a strange comment. What you’re really saying is that China’s ability to hurt itself by retaliating against the US is limited, but we have a greater capacity to hurt ourselves by a further ramping up of a trade war. And somehow that means our “hand is getting stronger”??? Very strange. Menzie, how many of those actions are considered “fair”? Isn’t Fair Trade at the core of this issue, or is it all Trump’s fault for playing the hand he has to improve fairness? CoRev Why do you think “fair trade” is important? The point of international trade is to move to a higher indifference curve. Most “fair trade” policies end up helping a narrow sector of the economy at the expense of worsening overall welfare; i.e., you end up at a lower indifference curve. Yes, there are some textbook exceptions to free trade, but as a general rule “fair trade” policies usually end up making everyone worse off. If you’re worried about fairness issues, then you should be talking about the equitable redistribution of the gains from trade. Harmless Harvest is running these ads on the NYC subway that we should buy their coconut water because: (1) it is fair trade; and (2) it is expensive. (2) is certainly right as its price is twice that of the 2nd most expensive coconut water on the market. Coconut water? Excuse me but no way I’m paying double the price of overpriced Zico. They may call that fair but I call it a rip off. 2slugs, indifference curve? Most professions develop and utilize jargon as short hand to pass knowledge among its practitioners. But, you know what, the average voter is not impressed by jargon. They want jobs, good salaries, and decent living conditions. Their position on the indifference curve of that bundle of needs is reflected at the ballot box. The point of international trade is to acquire goods and services of higher quality, quantity, and lower price than is currently available locally. There can be some compromise on quality if the price is sufficiently lower than locally available. Most fair trade agreements eventuate into free trade agreements and practices. You’ve been brain washed. Or your belief that “the equitable redistribution of the gains from trade” is superior drives your ignorance. Provide a list of countries where that policy has succeeded in sustained improvement. I’ll then provide a list of countries where it has failed. The term “fair trade” is a euphemism for protectionism. It’s the same when you hear politicians appeal to a “level playing field” as a basis for imposing tariffs. Because they are really calls for protectionist tariffs, and in the real world tariffs make everyone worse off. True, there are some textbook cases in which a tariff can improve the terms of trade of a large country assuming other countries don’t retaliate; but in the real world other countries do retaliate, which dissipates the terms of trade advantage. In the end, everyone is made worse off. To the extent that this is true, it only happens after a very long time. It took a couple hundred years before this country began championing free trade. And in Europe it took a couple thousand years. In both cases the free trade world that took so long to build is in jeopardy. The real history is that free trade agreements tend to be very fragile, not least because the arguments for free trade are frequently counter-intuitive and unfamiliar to voters. your belief that “the equitable redistribution of the gains from trade” is superior drives your ignorance. Quite the contrary. Globalization has hurt downscale workers even as the gains from globalization have gone to elites. The reaction of downscale voters is to demand protectionist policies in the vain hope that tariffs will improve their economic position. In the end those protectionist policies will only leave both the elites and the downscale workers even worse off. It’s mathematically true that the gains from free trade exceed the losses suffered by downscale workers who are hurt by free trade, so some of the gains should be redirected to those who have lost out because of free trade. Among economists there is near universal agreement on this point. Seriously, you need to invest some time and effort into learning some basic textbook economics. Sigh, 2slugs, when I refer to Fair Trade, I use the current definition: “Fair trade. Fair trade is a social movement whose stated goal is to help producers in developing countries achieve better trading conditions and to promote sustainable farming. Members of the movement advocate the payment of higher prices to exporters, as well as improved social and environmental standards.” not my personal definition. Too often we see you misinterpret a commonly used term substituting your own personal interpretation, and then berating someone using a different meaning from yours. Then when you arrogantly make recommendations for needed study, when it is you who is wrong, just shows you misplaced belief in yourself (haughtiness · conceit · hubris · self-importance · egotism · sense of superiority · pomposity · high-handedness · swagger · boasting). We see this too often from you, with too little evidence of it validity. CoRev You’re referring to the fair trade movement. That’s a different kettle of fish. The fair trade movement is what I might find when I go down to my favorite coffee shop and notice that the menu board offers “fair trade” coffee for another 50 cents per cup. That kind of “fair trade” refers to co-op agreements with small coffee growers such that they get paid a non-monopsony wage. That’s not what I’m talking about, which I assumed was clear by the context. The “fair trade” that I’m talking about is what you hear from union leaders and industry spokespersons wanting the government to protect industry specific commodities. For example, you’ll hear industry representatives say that they want free trade, but it also has to be fair trade. In other words, they see their industry as suffering a competitive disadvantage and the want the government to “level the playing field.” When the background topic is about tariffs, it should be clear by the context that “fair trade” is referring to the euphemism used by industry representatives wanting a tariff and not the “fair trade” movement that you’re talking about. corev, how exactly are you applying this definition of fair trade to the current china-us situation? Just because union and industry leaders are unclear and mix/misuse the terms does not forgive your misuse and then berating others who do not follow that practice. My point was and has been clear for these many years when your arrogance over rides your actual knowledge. Stop being a know it all. You don’t know it all! Baffled The Us and China are moving beyond a Fair Trade relationship into Free Trade negotiations. Look up the difference if you are unclear of what it means, and which one recognizes and accepts the advantages/disadvantages of the two trading partners versus leveling the trading practices. Examples of these relationships are: Fair Trade the U.S. and N. Korea today and Japan after WWII, and Free Trade the various NAFTA and NAFTA-like agreements with the US. Obviously, even free trade agreements can have some room for negotiating more equity in trade restraints when differences exist. With these partners most equity differences exist within common industries. That’s why we are such wide spread trade negotiations. Luckily, there are fewer countries in N. Korea’s position where Fair Trade is a national versus industry concern. all i am asking is how is the definition you later wanted to invoke regarding fair trade, which you used to disparage 2slugs, applicable to china and the us today? i don’t think when you brought up the issue of fair trade and china, you were talking about the social movement “fair trade”. yet you disparaged 2slugs and slightly shifted your argument away from china and towards the koreas. it appears you are the one slipping between the definitions of free and fair trade as convenience dictates. CoRev “Fair trade” as used by unions and industry representatives predates (by many decades) the use of that term by the “fair trade” movement. Baffled, the 1ast sentence you quoted says it all: ““Menzie, how many of those actions are considered “fair”?” i will admit I should have used fairness in trade instead of Fair Trade. Mea culpa. The rest of your comment is your misunderstanding of the differences. Some confusion was cause by my misspeaking/mistake. China and N. Korea are still in Free Trade territory. We are negotiating with China to improve fairness in our trade, and move into an improved Free Trade territory. at last, corev has actually admitted he was wrong. now apologize to 2slugs, since it was you who was not very clear in what you meant by “fair trade”. now you admitted in the previous statement you made a mistake. don’t turn around and blame me for your mistake. that is doubling down on ones own failure. i was not the one with the misunderstanding, you were. i was simply pointing out that YOUR comments did not make sense as stated. i accept your apology. Baffled, I did it again in my response to you. I was thinking China and N. Korea are in FAIR trade territory, and we are trying to move China into improved Free trade territory. a point krugman has made many times through the years. i think the issue at hand, with folks like corev, is terminology. when making these argument, typically one resorts to words such as “redistribute” to indicate how some of the spoils of free trade need to be shared across the board. but as soon as you use the word “redistribute”, then critters such as corev immediately resort to their ideological arguments. that is when you hear the words like socialist, communist, etc. at that point, they become rabid animals, and lose the ability to comprehend the economics of the remark. we need to come up with a new word, rather than redistribute or redirect, which does not set off the ideology reflex of these critters before you can ever hope they will read an economics textbook and learn. kind of like when i was 5, and my mom called liver as “chopped steak” to get me to eat it. because liver was thought to be disgusting. but that “chopped steak” was delicious. Baffled, to specifically what are you referring when commenting about me? Or are you still just trolling? your inability to comprehend this statement. We have all been brainwashed by the New World Order controlled media, Hollywood, foundations, history, polysci, and economics departments. It’s been slick, it’s been continuously refined, and it started a century ago with Bernays. War after war were unnecessary. But a strange thing happened on the way to the forum. The internet!!! People now in large numbers are awakening to the deception, omission, and propaganda. At an exponentially increasing rate. Fake news. With just this single meme, everyone with at least a half a brain has a glimmer now. I state definitively that everything you thought you knew about the key events of the past 125 years is upside down from the truth. Most have no comprehension of this. Because few are truth seekers. Few have the insight and inclination to think past the first derivative. This too is changing, however, as one after another American awakens and talks to others. Those least susceptible to awakening are those with the most closed minds. Those who by nature or training can and do think outside the box are the avant-guarde early champions of the great paradigm change descending upon us. The humble onion is pert here. Some … their outer layer wholly impervious to the arrows of truth the universe continually slings. Often very bright. Waste no time on them. Others, you can penetrate that first layer. But then they need much time to digest the shock to their belief system before the next layer can be addressed. Others still, the layers fairly fly away. Often the latter have undergone a great personal crisis sometime earlier. Having survived, they are forever changed. They have a great gift. The fear so tightly coiled in so many others which makes that outer layer so impervious is greatly reduced in them. Their onion skins are ripe for the peeling. By your understanding of this or your lack, you have a mirror to see into yourself. Even if only dimly. What does this have to do with economics? Why … everything. Eh, CoRev? You think? Still wearing that tinfoil hat I see. Look out! Here come those black helicopters!